UPDATE: 20th Century Fox has confirmed that the synopsis included in the story below is not official and does not represent the movie Logan. It was provided by a person working for Berlin Film Festival and does not feature actual plot points from the movie. ORIGINAL STORY: While most film festivals celebrate the best that indie filmmaking has to offer, it's fairly common for prestigious festivals to host out-of-competition premieres for big-budget studio films. Keeping with that tradition, 20th Century Fox will hold the world premiere of its highly-anticipated superhero adventure Logan at the Berlin Film Festival, with the premiere slated for Friday, February 17, with additional screenings slated throughout the weekend. While we still have a few weeks before the premiere, the festival has unveiled the movie's official runtime, plus a full synopsis. The Berlin Film Festival program guide features a schedule of screenings, plus a brief biography of director James Mangold, along with links to purchase tickets. It also reveals that the official runtime is 135 minutes, or two hours and 15 minutes. This movie will come in just one minute under 2013's The Wolverine, which ran 136 minutes, but it's still much longer than the much-maligned 2009 film X-Men Origins: Wolverine, which ran 107 minutes. Here's the official synopsis from the Berlin Film Festival website, which reveals some interesting details. "In 2024 the mutant population has shrunk significantly and the X-Men have disbanded. Logan, whose power to self-heal is dwindling, has surrendered himself to alcohol and now earns a living as a chauffeur. He takes care of the ailing old Professor X whom he keeps hidden away. One day, a female stranger asks Logan to drive a girl named Laura to the Canadian border. At first he refuses, but the Professor has been waiting for a long time for her to appear. Laura possesses an extraordinary fighting prowess and is in many ways like Wolverine. She is pursued by sinister figures working for a powerful corporation; this is because her DNA contains the secret that connects her to Logan. A relentless pursuit begins. In this third cinematic outing featuring the Marvel comic book character Wolverine we see the superheroes beset by everyday problems. They are ageing, ailing and struggling to survive financially. A decrepit Logan is forced to ask himself if he can or even wants to put his remaining powers to good use. It would appear that in the near-future, the times in which they were able put the world to rights with razor sharp claws and telepathic powers are now over." This plot rundown is much more detailed than the synopsis released last month, which teased that Logan is caring for an "ailing Professor X in a hide out on the Mexican border," although their plans are upended when a young mutant arrives, "being pursued by dark forces." 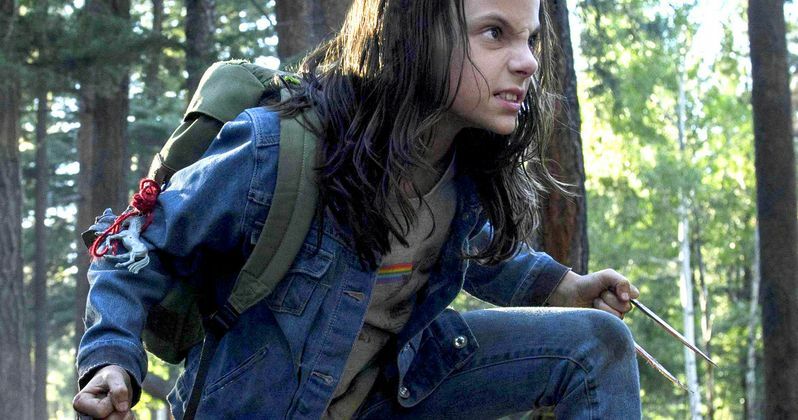 This new synopsis reveals that Professor X has been waiting for the arrival of X-23 for quite some time, and essentially confirms that the vial of Wolverine's blood seen in the post-credits scene of X-Men: Apocalypse was used to create X-23, a plot point which has long been assumed since it falls in line with X-23's creation in the comics. As for the runtime, Logan does fall short of the last two X-Men movies, 2014's X-Men: Days of Future Past (158 minutes) and last year's X-Men: Apocalypse (147 minutes). Those two movies have a much bigger cast of mutant characters to deal with, so it's understandable that they would be significantly longer. We saw in the latest trailer that there will be X-Men comics that are published within this world, which Logan discovers young X-23 is a fan of. For those who can't attend the Berlin premiere, Logan will hit theaters March 3, going up against Open Road Fims' Before I Fall, The Weinstein Company's Leap and Lionsgate's The Shack.